I’ll keep this short. Honest. (Stop laughing). But I do want to offer an update on the ongoing conversation here about the fate of the landmark 13 Cataract Street building. From Albert Stone, 1917. 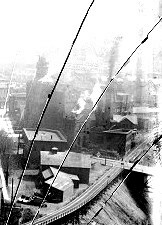 To the left of center, with the steam, is 13 Cataract Street. On the right, immediately adjacent to the railroad tracks, is the former packaging center. I have been in an email exchange with the staff of the building’s owner, North American Breweries (NAB). 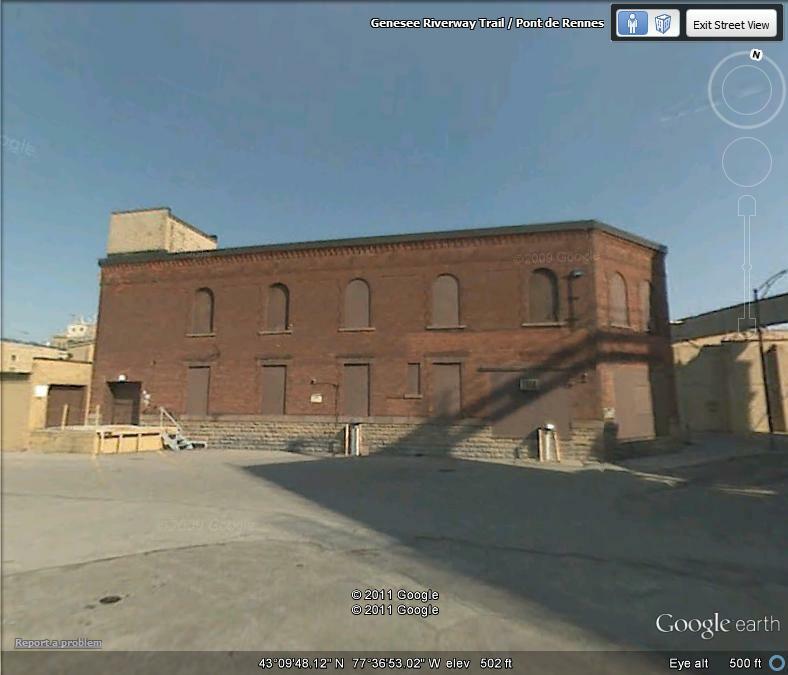 They have indicated that they have for some time intended to restore one building on their beer campus, that they assessed various possibilities based on size, space, cost, and location, and they did not select 13 Cataract Street, but instead chose another old building, the former packaging center. I am not sure why they decided to select just one building to save, but they did. NAB, the 8th largest brewing company in the U.S., decided that they would only preserve one of the historic structures on their campus. Seems a bit parsimonious at first inspection. But onward. The lovely old packaging building. 13 Cataract Street, a historic landmark. Having made their selection, they put 13 Cataract up for sale, and “dozens” of developers toured the hapless building. They tell me that “serious” buyers concluded that the rehab costs were prohibitive. They peg these costs at $2 million to stabilize and $5m to $8m to adaptively reuse. I have not seen estimates or drawings of any kind, so I can’t assess whether this is right or wrong. But remember, there is a 40% tax credit for rehabbing historic properties. This would certainly reduce the project costs, by millions. Then their explanations get a bit problematic, I think. They say that the reuse of the former packaging center “hinges on the abandoned buildings being removed.” Hmm. Not sure why – I suppose to make way for a parking lot. Why does their project “hinge” on the demolition of 13 Cataract? Have they asked the city about using a bit of the adjacent park to help them with their plans? And the use of the word abandoned is odd. They are the ones who abandoned 13 Cataract. It’s their building, not an absentee landlord’s. 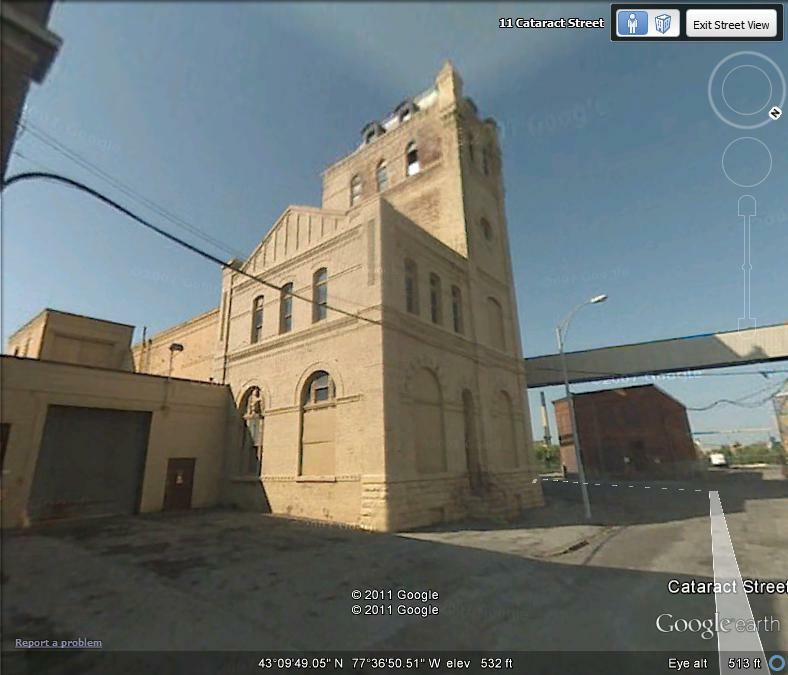 If they think of the “abandoned” building as a liability, they might consider donating it. In an instant, the building would be saved, their liability would disappear, and the costs associated with stabilizing and reusing 13 Cataract Street would vanish. And finally they tell me that they have a budget of $2.6 million, and that is the end of that. Okay, then. They have also let me know that the brewery staff are folks of good will, trying to do a good thing for themselves and the larger community. Okay again. Even people I admire enormously have made wayward decisions. I don’t know the beer folks at all, and I have no reason to doubt that they are good citizens. But I say again – tearing down 13 Cataract Street is not a good idea. Another reason demolition, instead of the creation of a broader beer campus and area plan, is not a good idea surfaced Tuesday morning in our newspaper, when we learned that our gas and electric utility, RG&E, is decommissioning their facility immediately across the river, in preparation for some as yet unspecified future redevelopment. For this entire portion of our city, this is a moment rich with possibilities. Finally, NAB suggests that we should not think that they are rushing to get this done, rushing to demolish 13 Cataract Street. Well, I wonder. But I have a solution, I think. I invite NAB to really reach out to the entire community, the city, the county, RG&E , and others for help in shaping a larger vision for the beer campus and High Falls. And let them ask us all for help in finding funding for a phased stabilization and adaptive reuse of both buildings. And to find immediate extra dollars to get this done I propose something simple. They seem quite set on a budget of $2.6m. But if we could help them raise a few million more, we might be able to assist in saving 13 Cataract too. You know, a kind of beer version of a region-wide pass-the-hat bake sale for NAB and their landmarks. All of you go along to your local pub this long weekend. Have a Genny or a Labatt’s Blue or a Magic Hat (NAB owns all of these). No, have several (designated drivers, please). The increased revenue from all this jovial beer drinking goes to the 13 Cataract Street Fund. We should be able to raise a pile of dough with just a little effort – bend an elbow or two, or three. Save the Cataract. No, save both Cataracts. This blindness is curable.